Thanks to Boccieri Golf and their Robo Golf Pro, you can “feel” your perfect on-plane golf swing, over and over again. Because golfers come in all different sizes, your plane will be a bit different than mine, and a lot different than that guy over there. The Robo Golf Pro is computer-coded with your individual physical size, together with your body’s flexibility and movement capabilities to swing you through your “personal” perfect swing plane. 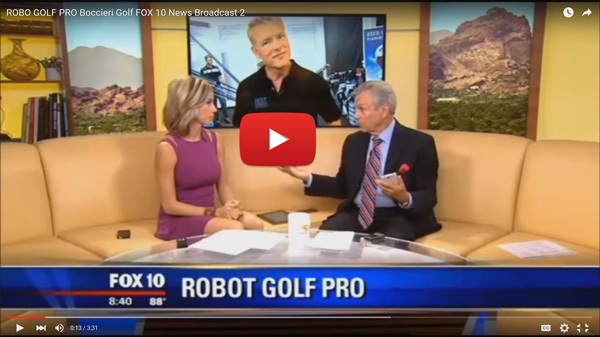 Watch the video to see the Robo Golf Pro in action with the Fox 10 News staff in Phoenix. The training at Boccieri Golf mixes repetitions of your perfect plane swing on the Robo Golf Pro with hitting balls. You’ll find the more you feel that perfect plane swing on the Robo, when you step around the corner and start hitting shots, the more often you can reproduce it – and you retain that feeling a little longer each time. For the average avid player, the results are immediate. Here’s our only warning: It’s a bit intoxicating. When you have a look at the shots your hitting with a move seems a lot easier than what you were using before, you’ll want more and more of that success. Get in touch with Boccieri Golf at 888.788.8374 and schedule a free, 30-minute session. Feeling where your body and golf club should be, makes it a lot easier to get into that position again. And everyone deserves to strike a perfect golf shot, even if you must travel to Scottsdale to do it.